Toronto Fashion Week is going out with a bang -- and not the good kind. 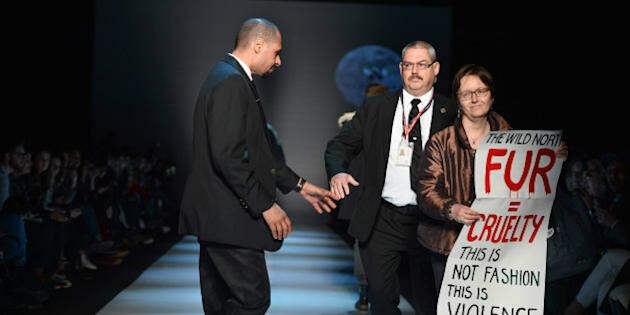 A protester took to the runway at World Mastercard Fashion Week to stand up against the use of fur in fashion. A woman walked onto the runway at The Wild North show holding a sign that read, "The Wild North. FUR = CRUELTY. This is not fashion this is violence." At first, it seemed as though the female protester was part of the show, but as she made her way to the (almost) end of the runway, a security guard ran out to remove her. We captured the action from the front row -- just check out the scene in the video below. During the show's finale, the models and designer walked out with a dog, which some found a little strange. Protesters were also spotted outside the tents at David Pecaut Square, holding signs with anti-fur messages. MORE: Fashion Week protester toronto fashion week Style the wild north the wild north toronto fashion week toronto fashion week toronto fashion week 2015 toronto fashion week fall 2015 video wild north wmcfw World MasterCard Fashion Week world mastercard fashion weel fall 2015.